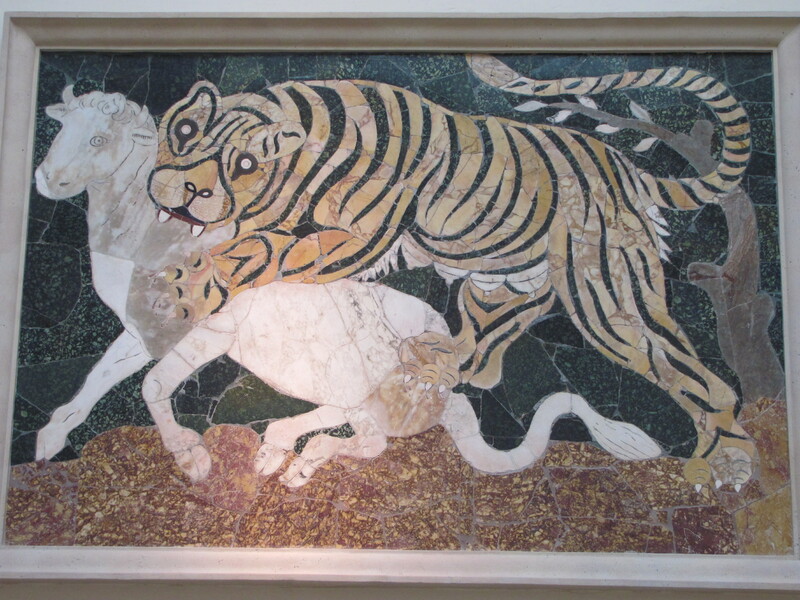 I’ve already commented on this blog about the pitfalls of the word Byzantine, especially in relation to the mosaic art of Late Antique and Early Mediaeval Rome. I stand by that perspective. Indeed, after a conference I was at earlier this year, I am even more deeply entrenched in my anti-Byzantine position. One of the many difficulties besetting the use of this word is its strong association with Greek and the Eastern Mediterranean (indeed, I think of Byzantine as Greek mediaeval, or mediaeval Greek, personally). 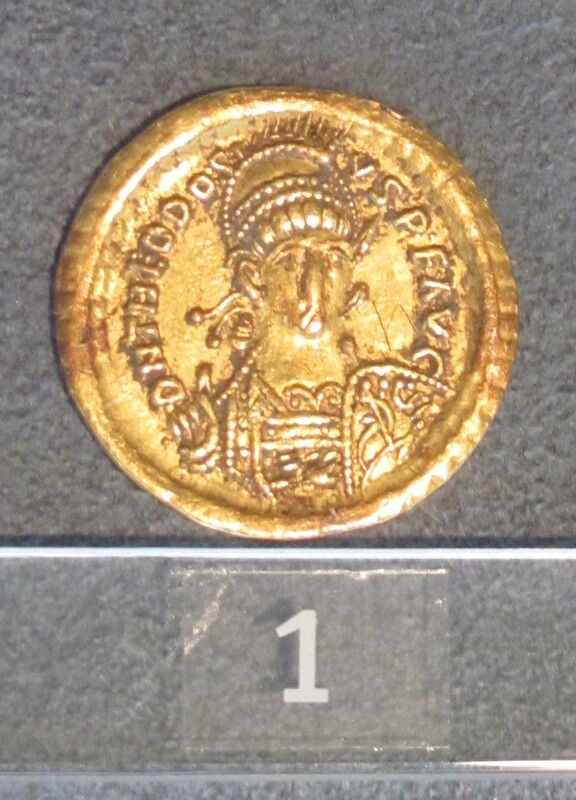 This is combined with the fact that, despite the great cultural and political ruptures of the seventh century, historians of ‘Byzantium’ and the ‘Byzantine’ Empire like to start their story with Constantine or something like that (in which case we are far enough back in time to be clearly in the Late Roman East). Why are these two things problems? I haven’t dealt with him in my ‘Discover Late Antiquity‘ series yet — not properly. Nevertheless, Justinian reconquers North Africa, a bit of Spain, and Italy. 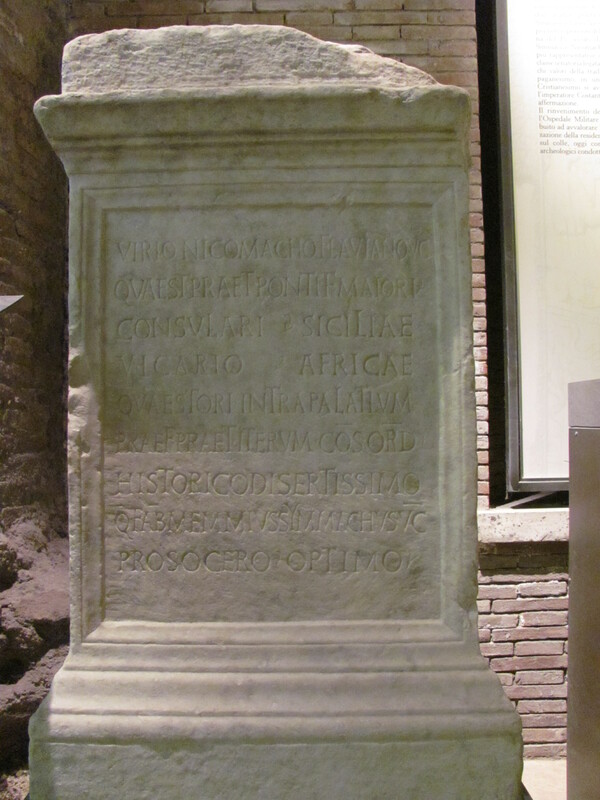 His (re)conquest of Italy ran from 536 to 554. As a result, the heartland of the Roman West was reunited with the Roman East. 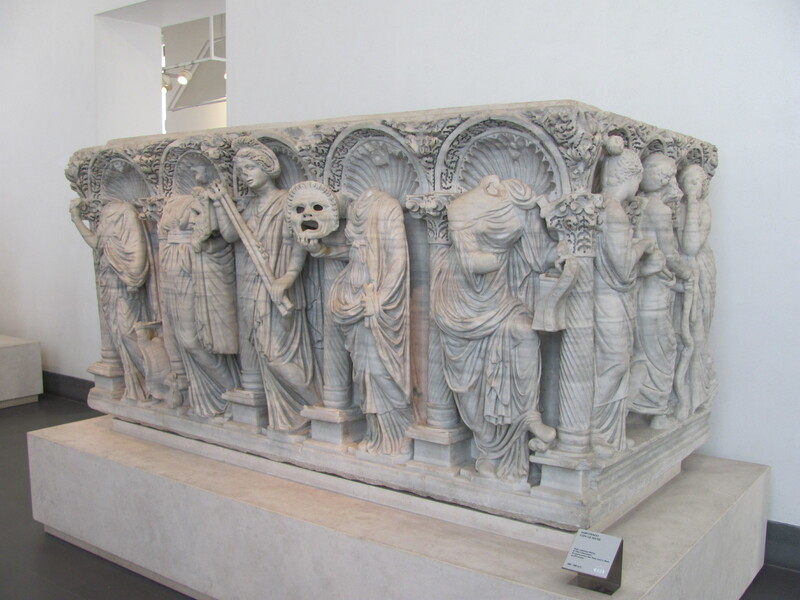 This increases the cross-cultural exchange between East and West — traditional Italian artwork of Late Antiquity thus maintains ties with the traditional Hellenic artwork of Late Antiquity (that is, the ‘Byzantine’). 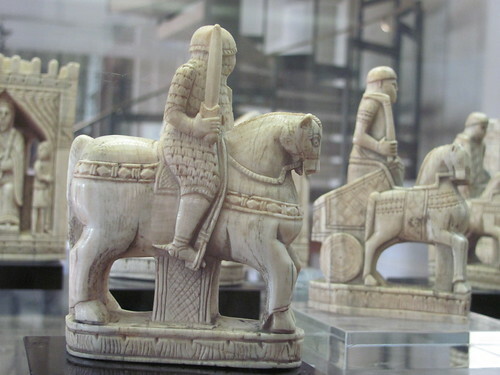 Eastern craftsmen can make their way West within a united empire. Let me now circle back to how the Hellenic, eastern-focussed use of this word and its application to art can cause problems. 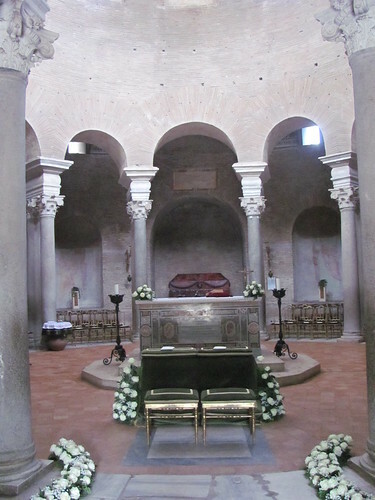 Nevertheless, Wikipedia is not the only source that will tell you that the Basilica Eufrasiana is ‘Byzantine’. At the aforementioned conference, one of the papers discussed the basilica’s images of female saints — all well and good. 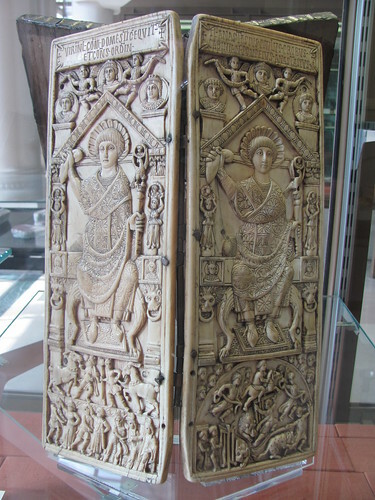 Indeed, given the fact that the Istrian Peninsula was part of the Byzantine world, I’d even be willing to grant limited use of the word Byzantine to the artistic style. 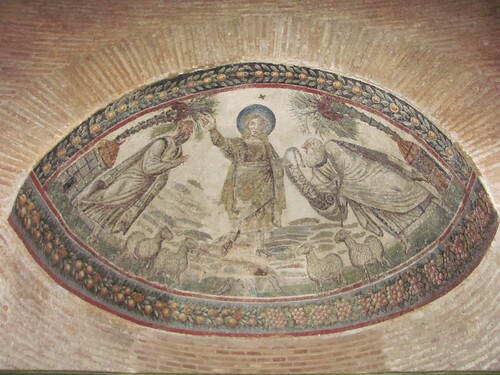 However, from being used of the art, this word began to applied to the cultural context and worldview of the people who commissioned it and used the basilica. And this simply will not do. Istria is not Greek. Istria was not Greek. 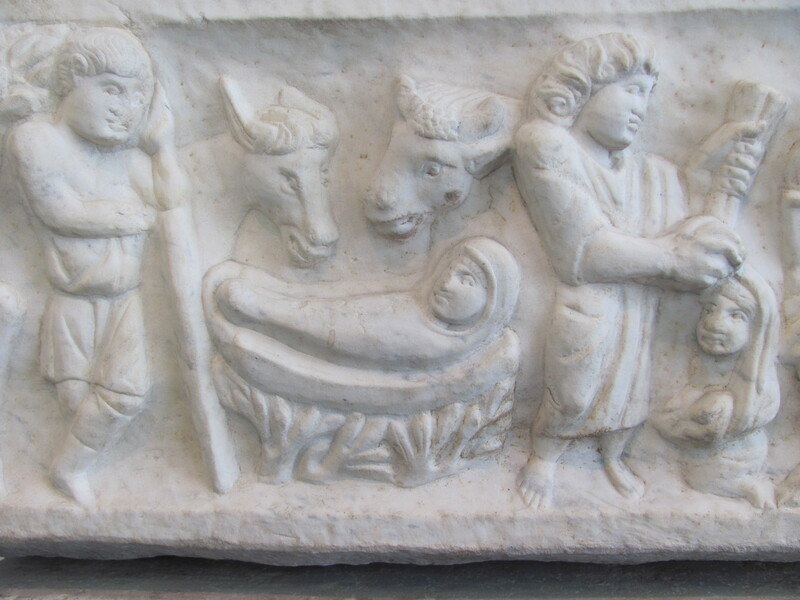 The cultural worldview of the sixth-century, Late Antique people of Istria was not Byzantine. 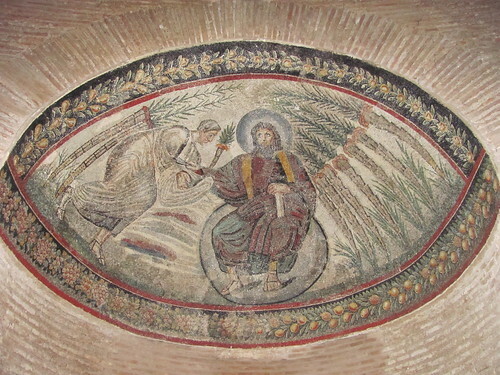 The reason this is a problem is because the presenter kept on finding Greek sources to corroborate her interpretation of the mosaics and the artistic scheme of the basilica. 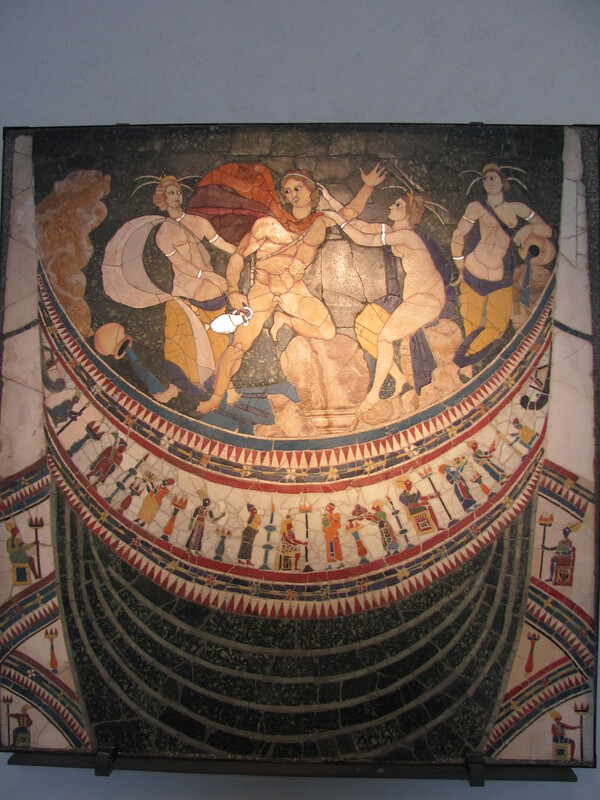 However, one glance at those same mosaics will show the viewer quite a lot of Latin — because that is the language of the Late Antique Istrians. 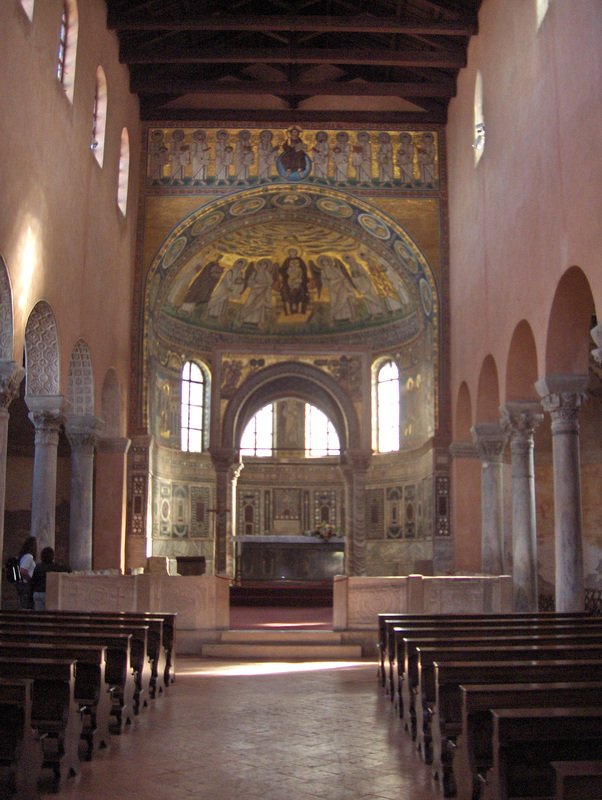 Ecclesiastically, in fact, the Istrian Peninsula was under the archiepiscopal oversight of the Bishop of Aquileia. 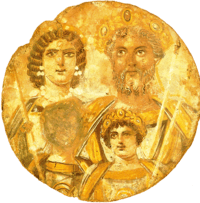 And, along with that bishop and some others, was among the places that, around this time, entered into schism with the Bishop of Rome over the Three Chapters (on which I’ve blogged here). 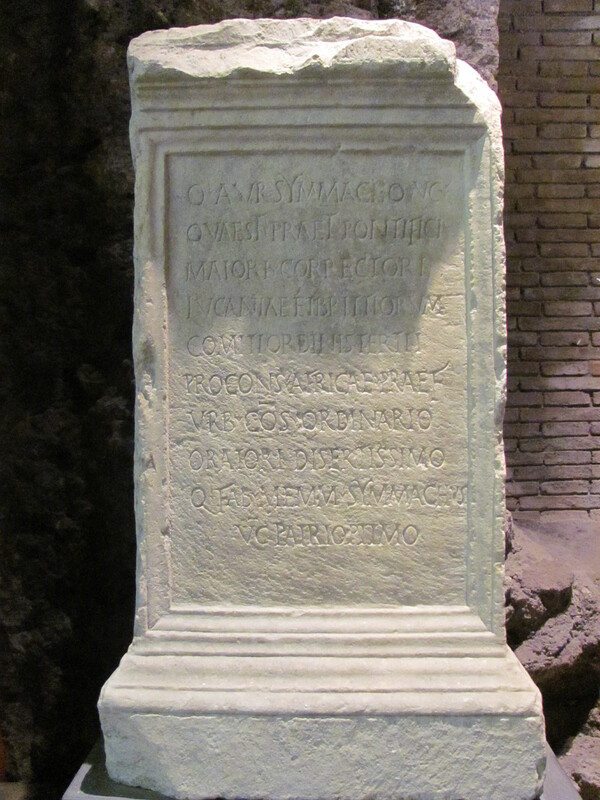 Therefore, Greek canon law is not germane to any discussion of how Istrians viewed women; Latin canon law, however, is. As are the writings of the ecclesiastics of Aquileia. Nonetheless, the paper to which I am referring continually resorted to Greek, ‘Byzantine’ sources. I can only guess that the reason was because of the overuse of this word to refer to all Late Antique art of a certain style, and a confusion between politics (yes, this was then part of the Eastern Roman Empire) and culture (but it was not, therefore, Greek). Byzantine is a word that can be very useful. But I find that the earlier it is applied, or the farther West it journeys, the more it simply confuses matters. 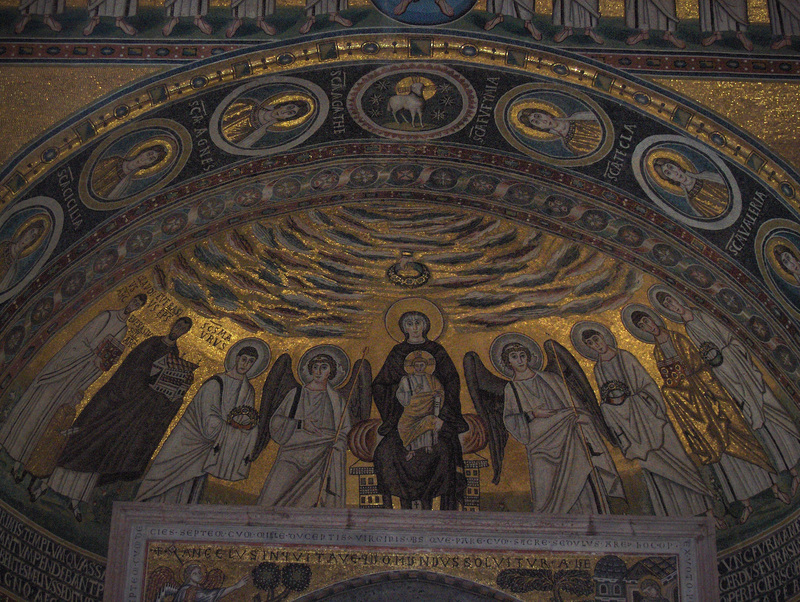 This entry was posted in Ancient World, Art, Christianity, Classics, History, Indignation, Mediaeval and tagged basilica eufrasiana, byzantine, byzantine art, croatia, histria, istria, justinian, late antique architecture, late antique art, porec on November 11, 2016 by MJH. 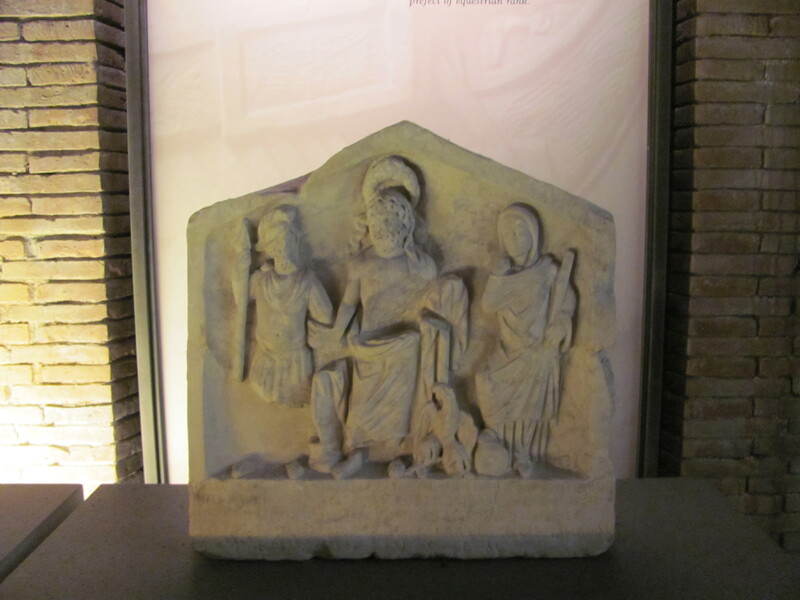 The Mausoleo di Santa Costanza was the first stop on my hunt for Late Antique Rome four weeks ago (although I’d seen the Baths of Diocletian [298-305] several times from the bus window already! ), given that it’s only a ten minute walk from where I’m staying. I tried going after work on a Friday night, but got there at 6:09 — nine minutes after closing! Alas. 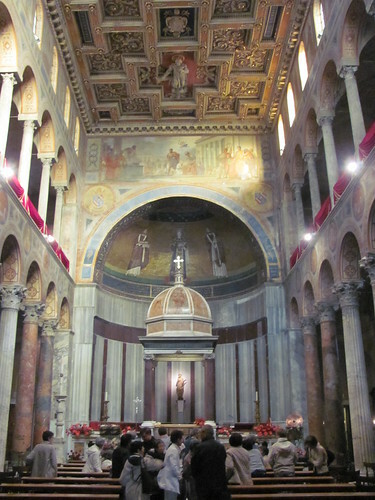 I peeked around at the seventh-century (and beyond) Basilica di Sant’Agnese at the bottom of the hill and returned the next morning to see Santa Costanza at the start of a long day of churches and museums! 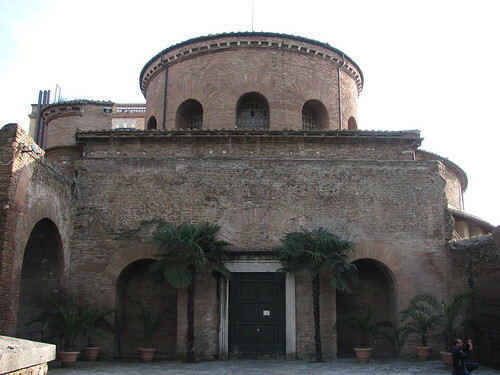 As you can see, the mausoleum, like similar, larger ones elsewhere in Rome (Castel Sant’Angelo [Hadrian’s] & Augustus’ spring to mind) is basically a large, brick cylinder on the outside. I understand that it was initially faced in coloured stone. 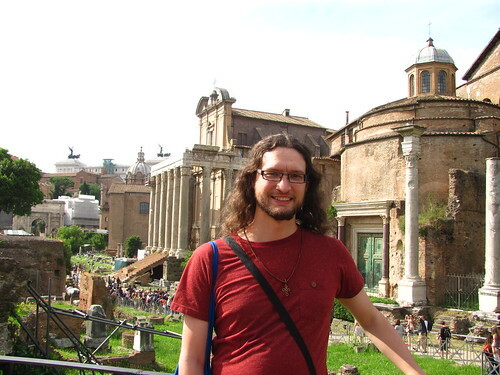 The mausoleum of Maxentius’ son is on the right, over my left shoulder. 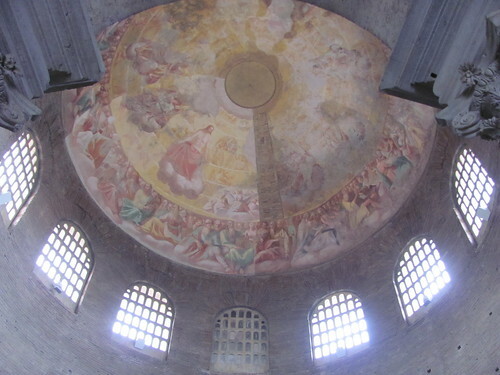 The real show case is the lightness of the interior, now a church (although Constantina was not a saint), with its circle of pillars supporting arches and a dome; the fresco is not original, although I think I read somewhere that the theme of it is. 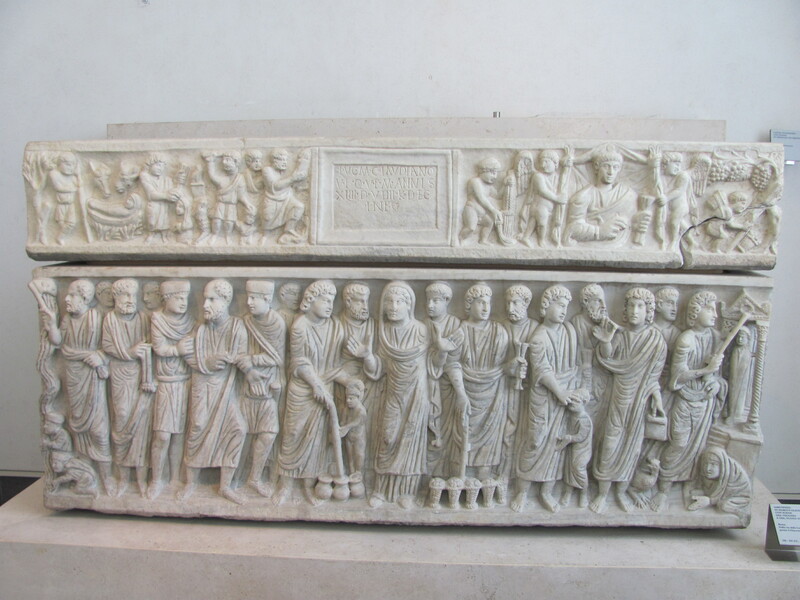 In the background of the first of these three photos, you can see a reproduction of Constantina’s porphyry sarcophagus, the original of which is now in the Vatican Museums. When they moved it, the cart required four oxen to pull it! Porphyry is a very heavy, very dense stone. 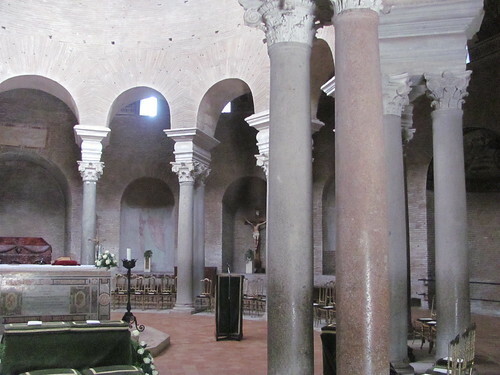 Architecturally, Santa Costanza reminds me of the Late Antique roots of Romanesque architecture. Italian Romanesque is never as heavy as it is somewhere like Durham Cathedral or Dunfermline Abbey, and I’ve read that some people refuse the name to Italian architecture of the Middle Ages. 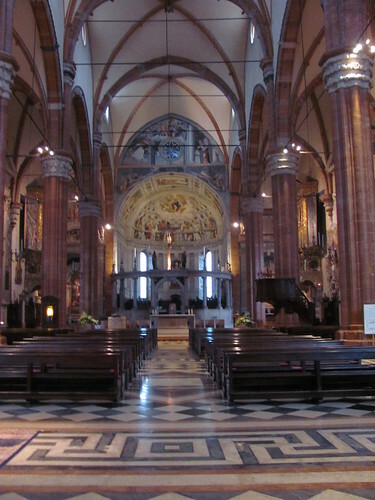 Be that as it may, Italian mediaeval architecture such as that visible in San Clemente or San Lorenzo Fuori le Mura or the churches of Verona is visibly and tangibly linked to this Late Antique style; tradition runs strong in Italian art and architecture. 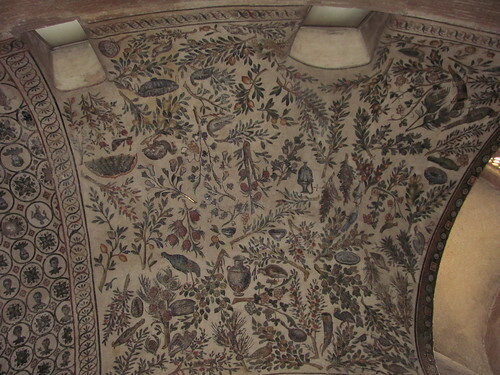 For me though, the real star of Santa Costanza is the interior decoration. 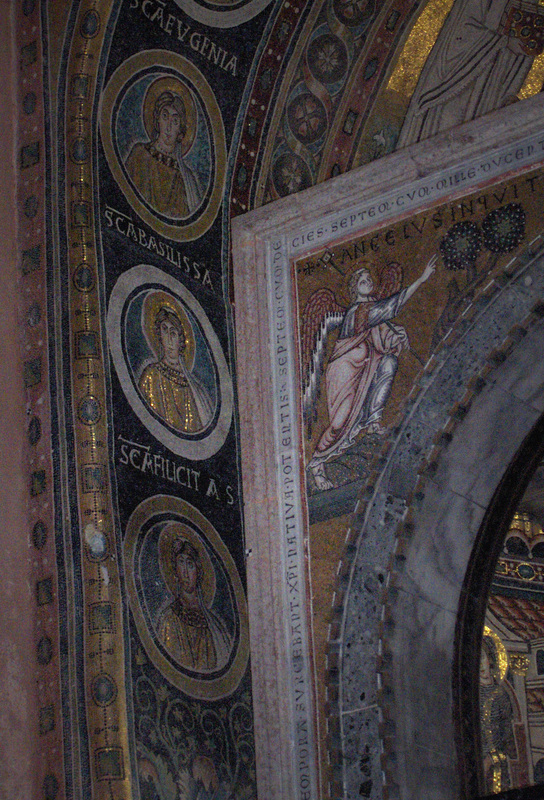 The ambulatory — that is, the space between the pillars and the outer wall — still has a good supply of the original mosaics. 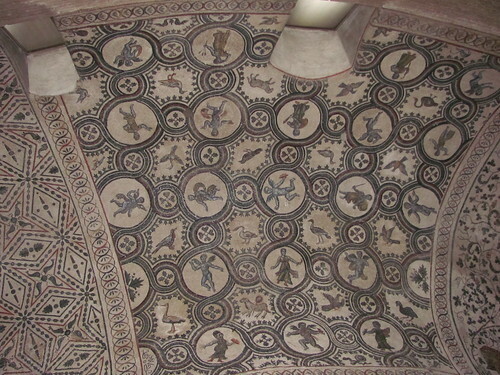 And I love mosaics, especially Late Antique and Early Mediaeval ones. I like that the people, including Jesus, are all dressed as Romans in these images. 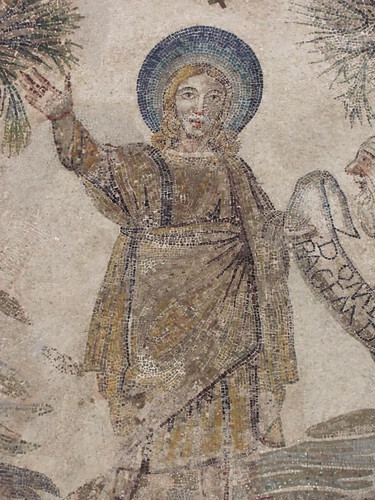 And bearded Jesus even has on a purple toga, which is fitting for the King of Kings. 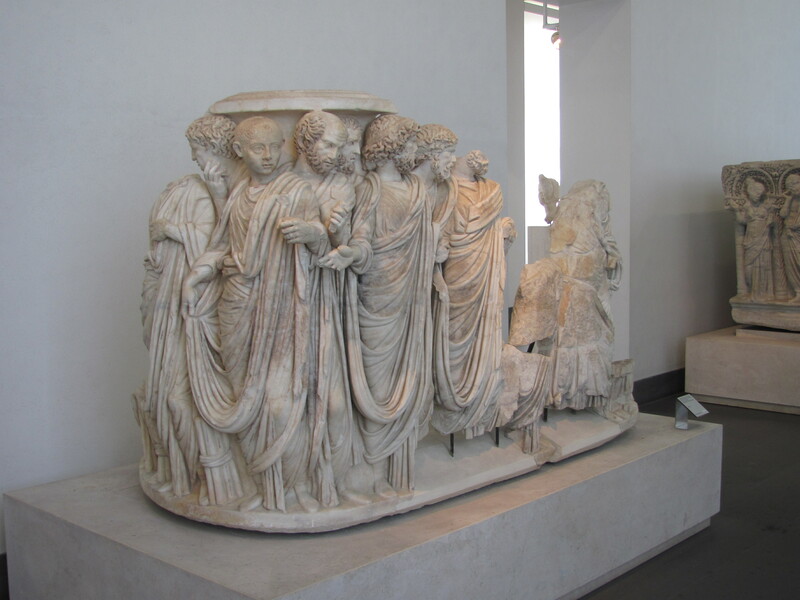 The others, too, have togas. Sometimes people criticise these old, encultured images of Jesus and the Apostles; sometimes those same people get excited about new, encultured images. 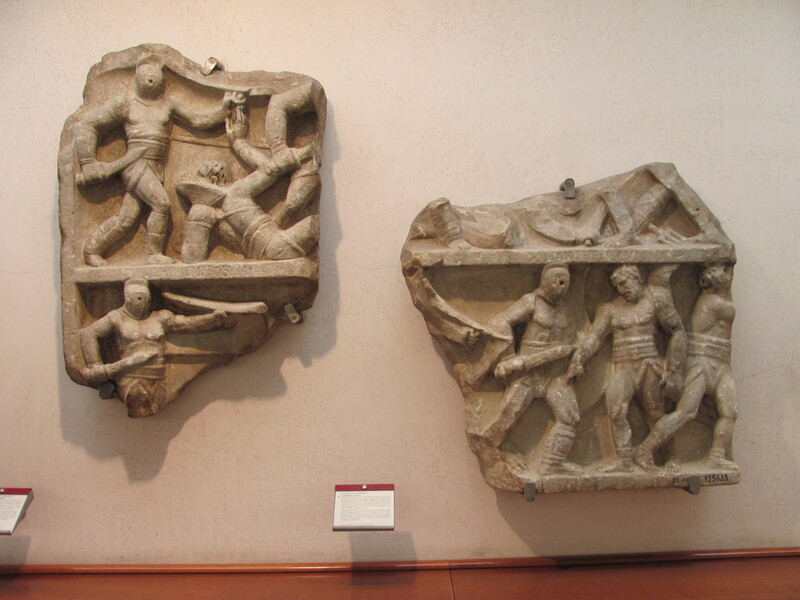 These images are portals into the mindsets of fourth-century Romans. 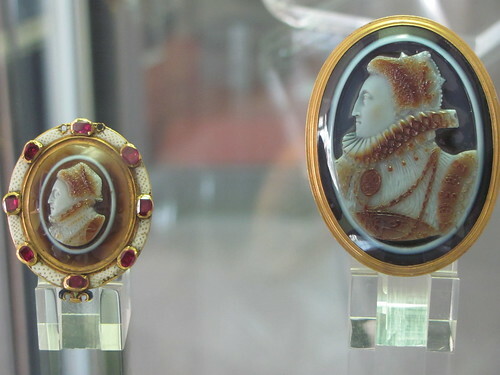 They are also portals into upper-class fashion of fourth-century Rome! 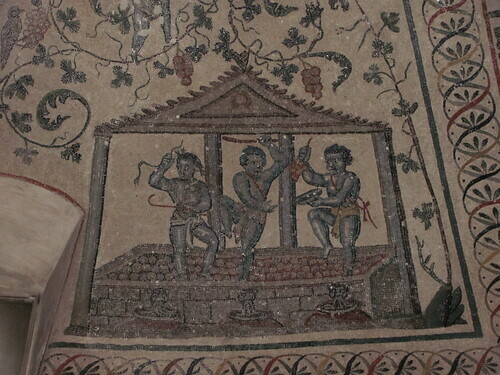 In a Late Antique mosaic, every stands out sharply. There is enough naturalism that these people do not look like children’s drawings, but there is a growing preference for showing things head-on. This is especially the case for Christ, who is the main attraction, after all. This is part of a wider movement of making a beautiful whole that is made up of smaller, brilliant pieces, each interesting in its own right — a stylistic departure from ‘classical’ modes of balance and proportion. 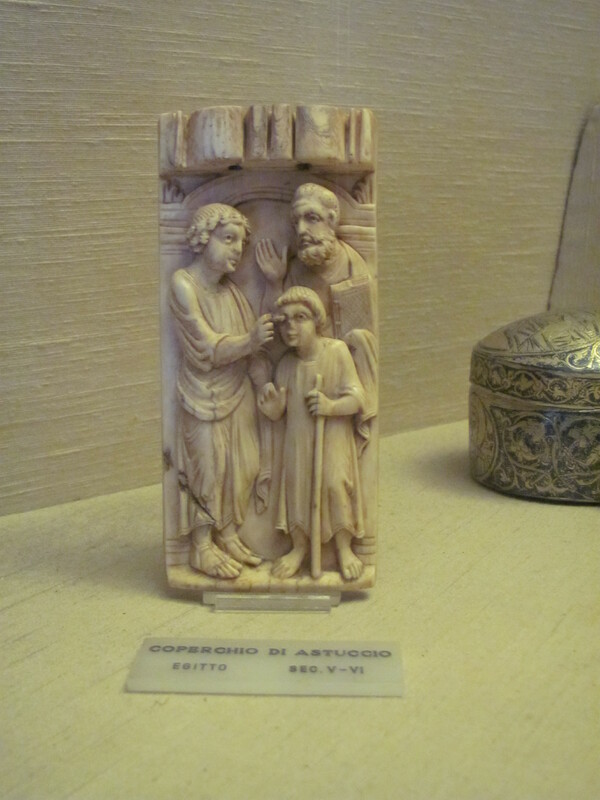 Finally, beardless Jesus is not surprising, since the Good Shepherd in the catacombs is himself beardless! I am not sure what the interpretation of him beardless is, though. Nonetheless, already in the 300s he has a halo. 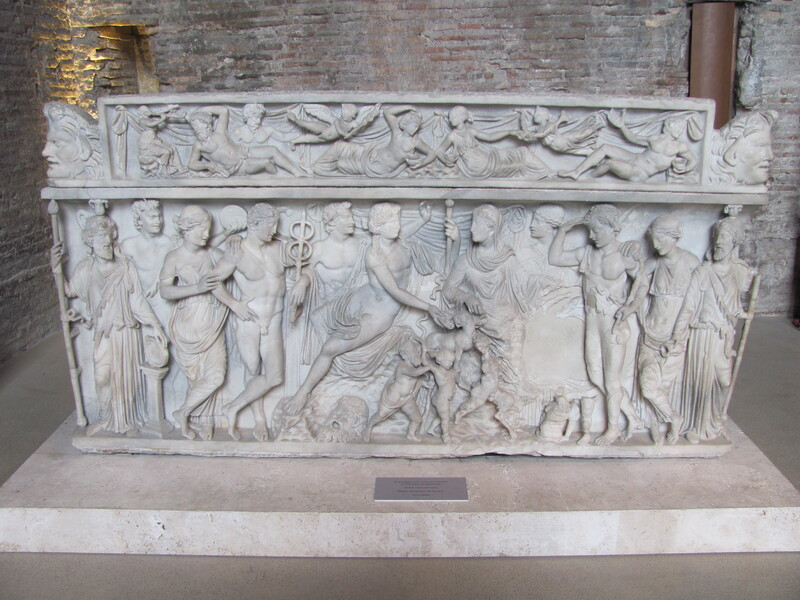 This entry was posted in Ancient World, Art, Christianity, Classics, Discover Late Antiquity, History, Mediaeval, My Travels, Patristics and tagged beardless jesus, late antique architecture, late antique art, mausoleo santa costanza, mausoleums, mosaics, sant'agnese fuori le mura, tempio di romolo on May 23, 2014 by MJH. Paris is a city of museums and galleries — the Louvre, d’Orsay, l’Orangerie, Cluny, la Crypte archéologique beneath Notre Dame, Carnavalet, Marmotan Monet, du quai Branly, Rodin, Invalides, Centre Georges Pompidou, and so forth. 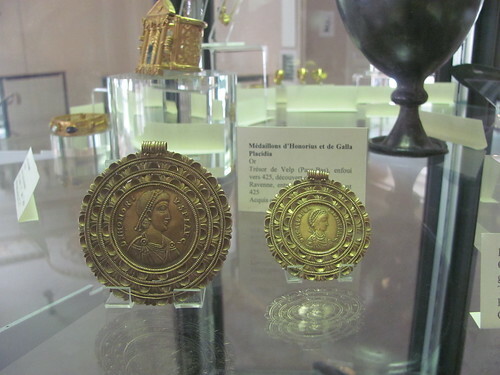 Last Saturday I visited what I think may be the best little museum here (and it’s free!! 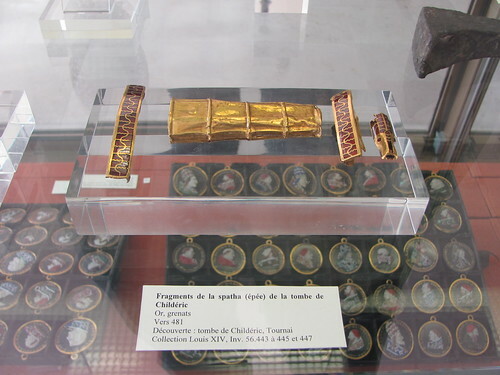 ), the Bibliotheque nationale de France’s (BnF) collection of ‘Monnaies, médailles et antiques’ — coins, medallions, and … antiquities? 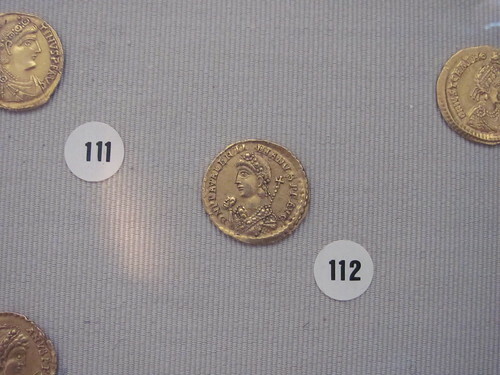 Now, you may think a museum that bills itself as a coin museum would be pretty lame. 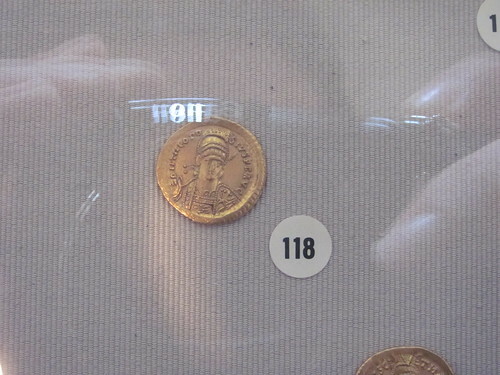 If you think thus, you’re clearly not that into numismatics and haven’t visited the Museum on the Mound in Edinburgh. 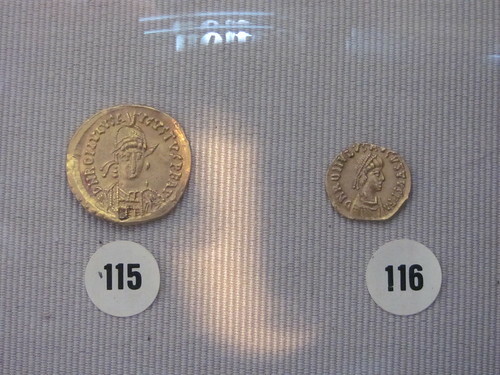 I have two things to say to you — 1. coins can be cool; 2. this museum isn’t only coins. It’s not even mostly coins. Or medallions. Mostly, antiques (antiquities??). At heart, this little two-floor museum is the BnF’s collection of the above items, on display for the public to view for free, no library card necessary!! (I have such a library card, but that’s beside the point.) It’s in the old library site, ‘Site Richelieu’, 5 Rue Vivienne, through the right entrance, and then up the big, marble staircase. I went expecting a bunch of small but awesome items, and I wasn’t disappointed. By small, I mean that the largest item, besides a headless statue torso, was a Mesopotamian stele with cuneiform on it — about three feet high. And a few statue heads. And a beautiful Persian sword. 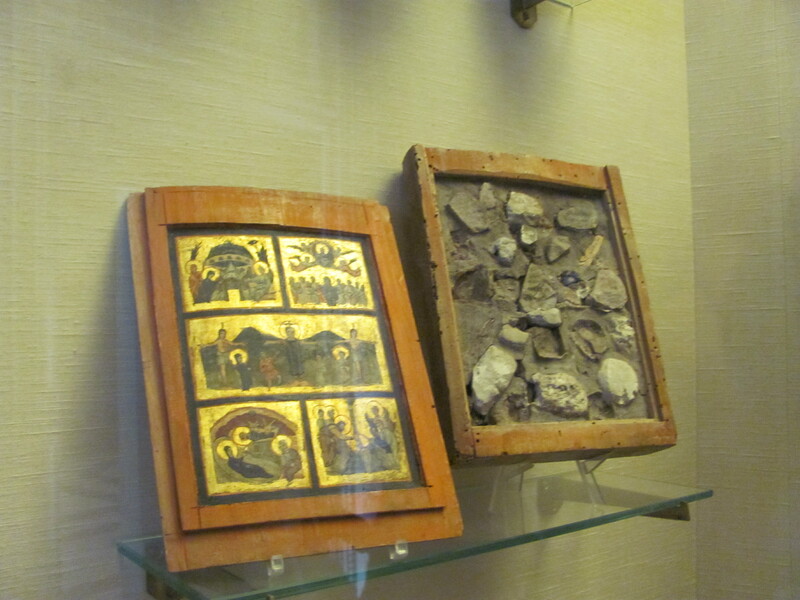 But most of the artefacts were small and most of the space was devoted to these small objects. 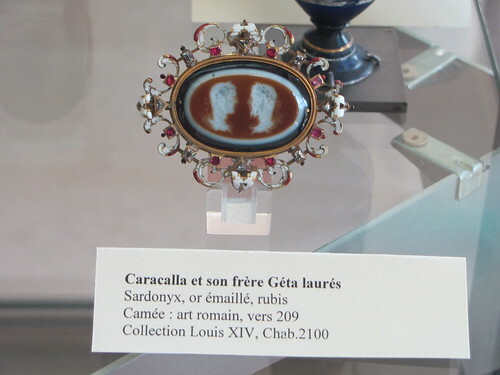 The first small items I enjoyed seeing were Early Modern, including a medallion from some French King or other (they’re all Louis or Charles, anyway), and cameos of Reine Elizabeth Iere d’Angleterre and Olivier Cromwell. Didn’t expect those – certainly not the latter! I loved the cameos, I really did. But we should move on. Because there was other amazing stuff. 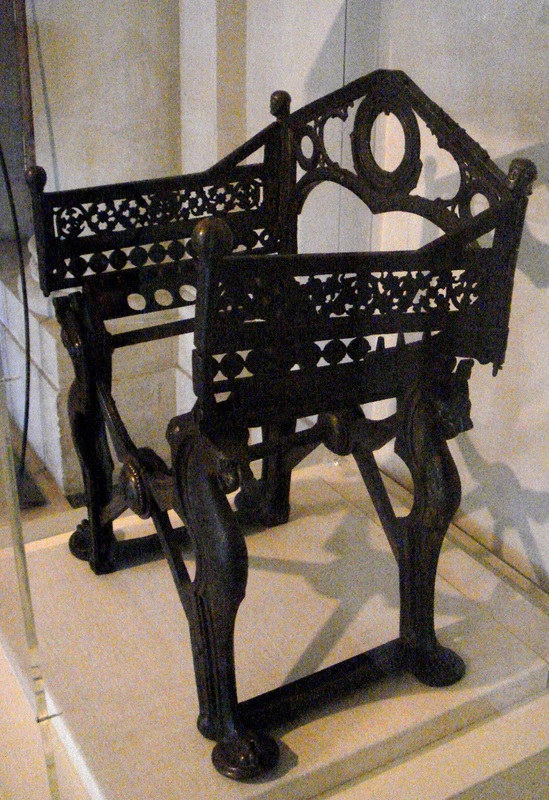 Like the throne of the Merovingian King Dagobert I (603-639). If it’s not his, it is at least seventh-century from the right part of the world. Not my photo; my photo is blurry. 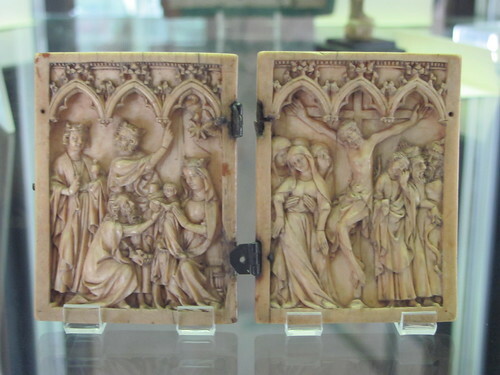 And the other ivory diptychs, to boot. This pleases me greatly, given that sometimes those centuries (the fifth in particular) feel a bit neglected in the world of museums. But not here. 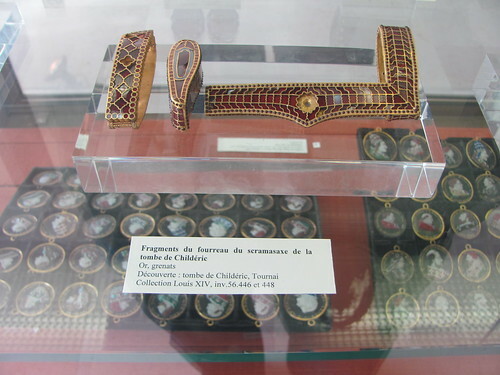 There were grave goods from the Merovingian King Childeric (d. 481)! 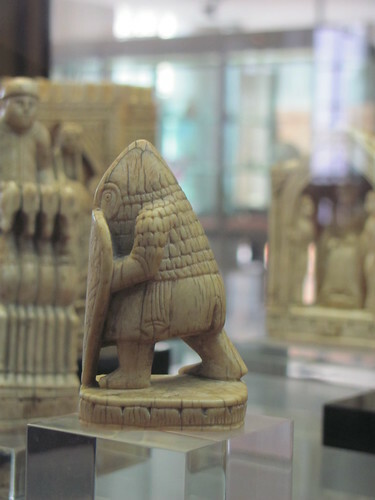 I recommend you visit if you’re ever in Paris, take in small objects, including Mesopotamian, Pharaonic Egyptian, Greek, Roman, Late Antique, Early Mediaeval, Central Mediaeval, and Early Modern ones. 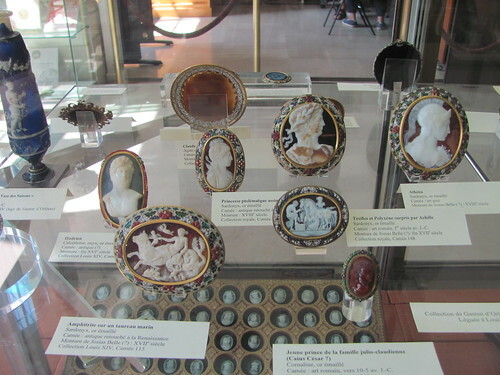 Small, beautiful, delicately-carved exquisite objects populate the two small floors of this museum. Worth seeing. 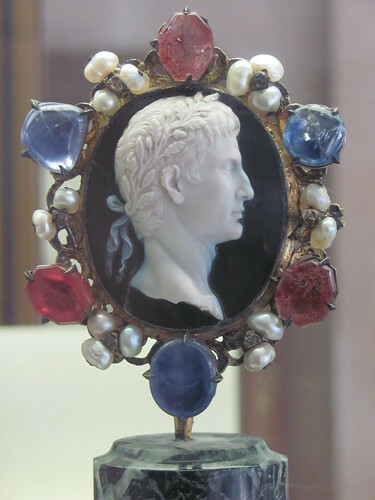 This entry was posted in Ancient World, Art, Classics, History, Mediaeval, My Travels and tagged ancient rome, cameos, childeric, coins, dagobert i, emperor augustus, geta, ivory carvings, late antique art, paris, valentinian iii on September 29, 2013 by MJH.